Starmobile added their newest flagship smartphone, the Starmobile Octa, to their installment plan for P1,415.83/month with 0% interest. 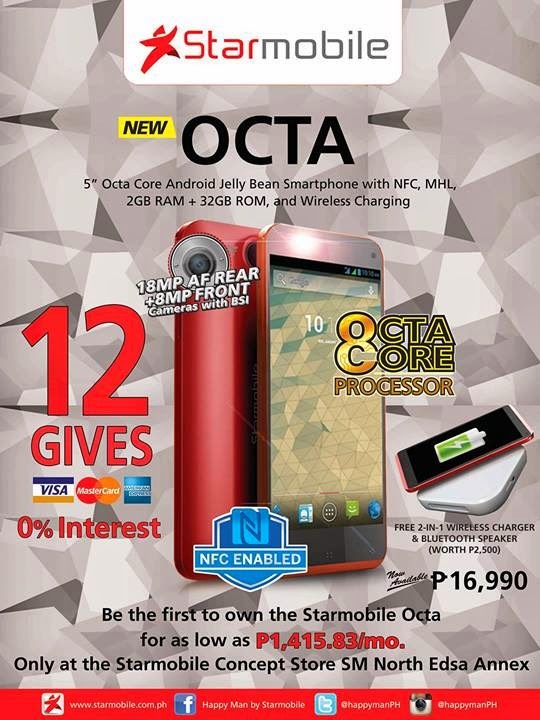 Starting today, Starmobile offer its Octacore smartphone in its 12 GIVES promo. The Octa sports 5-inch One Glass Solution(1920×1080) with Asahi Glass scratch resistant display. It has a powerful 1.7GHz octa-core processor ,complemented with Mali 450MP4 650Mhz quad-core, 2GB of RAM and 32GB internal storage. The handset available in red and black colors with tag price for Php16,990. You can get the new smartphone for P1,415.83/month with 0% interest in Starmobile Concept Store at SM City North EDSA Annex. The Octa has a free 2-in-1 Wireless charger and bluetooth speaker worth P2,500 when you avail the promo.